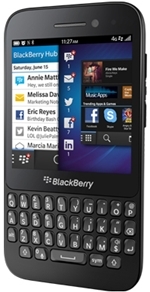 BlackBerry newest QWERTY Smartphone Q5 available from Virgin Mobile in United Kingdom. Prominent features of BlackBerry Q5 includes 3.1 inch of the touchscreen with resolution of 720 x 720 pixels , full a full QWERTY keyboard and 5 megapixel of rear camera plus 2 megapixel of a front facing camera. The handset also comes with 2GB of RAM and 8GB of built in storage, plus a 2,180 mAh battery. £30 per month – 1200 minutes, unlimited SMS and 1GB of data. £33 per month – Unlimited calls and SMS plus 3GB of data. £35 per month – Unlimited everything plus free calls to numbers starting with 0800, 0845, 0870 and 0808. If you are interested in purchasing BlackBerry Q5 check out the Virgin mobile website.